Welcome to the Wonderful World of Scuba! Learn to SCUBA dive with the professionals at Sonoma Coast Divers! We offer the SSI Open Water Certification Course, an internationally recognized diver certification program that we consider to be the finest in the world. We have been teaching in the Bay Area since 1978 (in our current location since 1998), and have an unequaled reputation for quality instruction. 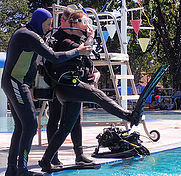 Our instructors teach courses that are fun, but also stress the techniques needed to become a safe and comfortable diver. If you are in good health and free from heart and lung problems, you can learn to SCUBA dive! As the second largest certification agency, Scuba Schools International offers flexible and comprehensive instruction that will take you·all the way from Open Water Diver to Master Diver and beyond! As an SSI Platinum Facility, we can offer classes all the way from Discover Scuba through Instructor Trainer, the highest level of diving certification. Our pool and ocean sessions use only the finest equipment available. We have a selection of high-end regulators, computers, and buoyancy comensating vests that will offer you the safest, most comfortable experience possible. We even have equipment specialized for the unique needs of women and children. Dive computers and weight integrated buoyancy compensators are used exclusively to make your training more comprehensive and your dives more enjoyable and safe. Weekend Courses require an orientation at least one week before the course date. The Class/Pool schedule will be on Saturday and Sunday from approximately 9am to 5pm for the pool and classroom sessions. The ocean dives are conducted the following weekend on the Sonoma or Mendocino Coasts or Monterey during the Winter. Private lessons are available at your convenience. They can be conducted at our facility or in the privacy of your own home and pool. The cost varies with the number of students. Please call us for pricing. Courses begin with choosing a class that works with your schedule. When you call us to sign up for class, we will tell you how to register on SSI's website. The registration will allow you access to the Digital Learning System. These comprehensive videos, quizzes, and learning tools will give you everything you need to know to be a SCUBA Diver. These systems help you become familiar with the terminology and skills scuba divers use, this allows us to really focus on the hands-on portion of the course ! Depending on the type of course you choose, the dates and times of your pool sessions will vary. You'll spend 2 days doing pool and classroom work. Here we'll go over all the information you learned in your digital learngin materials. We'll answer all your questions and you'll get to spend more time IN THE WATER because you have already started learning before you arrive. We offer a 2-day pool session because we believe spending 2 days in the pool develops your skills and makes you a better, more comfortable diver. We believe this is essential to learning to dive. On the last day of class, you'll take your written test. Now you're ready for the ocean! Our ocean dives are usually conducted on our beautiful North Coast. During Winter months, we will take our classes to Monterey. If you've never taken a look beneath the California Coast, prepare to be surprised! Our coastline is home to the richest marine environment on the planet! You'll see abalone, lingcod and other rockfish, starfish, sunstars, kelp fish, nudibranchs, snails, crabs, scallops, hard corals and maybe even the resident octopus! For more information on what you'll see and about California diving, check out our California Diving Page! Your Scuba course includes one optional skin dive (snorkel) and at least 4 open water scuba dives. Because fit and comfort are essential for enjoyment and safety while SCUBA diving, we recommend our students purchase their Personal Snorkeling Equipment – mask, fins, snorkel, boots, and gloves. Although not recommended, personal equipment may be rented for an additional charge for both pool and ocean dives. We sell a variety of major brands of equipment and our professional staff will be happy to assist you in the proper selection of your gear. We offer special package pricing on personal snorkeling equipment to students who are enrolled in our program; we also allow our students to use the equipment they purchase in the pool and exchange it if they find it isn't fitting as well as they thought it would- we want you to love your new gear! If you have any questions, please do not hesitate to call the store or drop by! Our staff will be happy to assist you in all your diving needs. As with any physical activity, there are certain medical issues that may preclude you from scuba diving. Exercise or stress induced asthma or certain heart and lung conditions can be a problem. Please give us a call if you are not sure about these requirements and we can help you. Diving is a fun and easy sport, and we are firm believers that anyone with the desire can learn to dive; however we also want to make sure our students are safe and healthy enough to enjoy their diving adventures! If you have questions about this or any aspect of the course, please feel free to give us a call! ​Due to staffing and equipment logistics, you may change the dates of your class until three weeks prior to the class start. After that, a $50-$100 rescheduling or cancellation charge will be incurred. Beginning the Monday prior to your class, there are no refunds and no transfers; all tuition paid is forefit. Enriched Air Nitrox is a blended gas that had more oxygen in it than regular compressed air. The additional oxygen levels allow you to stay down longer as you are absorbing less nitrogen on your dive. This lets you do longer dives in a shorter period of time, but also requires you stay at shallower depths. Many people report feeling less tired after diving with Nitrox as well. Learn all the benefits and hazards of diving with Nitrox, how to analyze a tank to know exactly the O2 content, the special equipment you may need, and how Nitrox affects your body. We consider rescue skills to be an essential part of every diver's education. The SSI Stress & Rescue Course builds confidence by making you comfortable with your ability to assess and handle diving emergencies. Join us for Monterey Fun Dives this June! Boat Dives on Saturday June 15th followed the next day by Shore Dives on June 16th. Join us for a day of diving on the North Coast. Sunday May 26th at 8AM. Join us for Monterey Fun Dives this May! Boat Dives on Saturday May 18th followed the next day by Shore Dives on May 19th.